Did you know that sweet potatoes aren’t just orange? You can find them in purple and white as well! 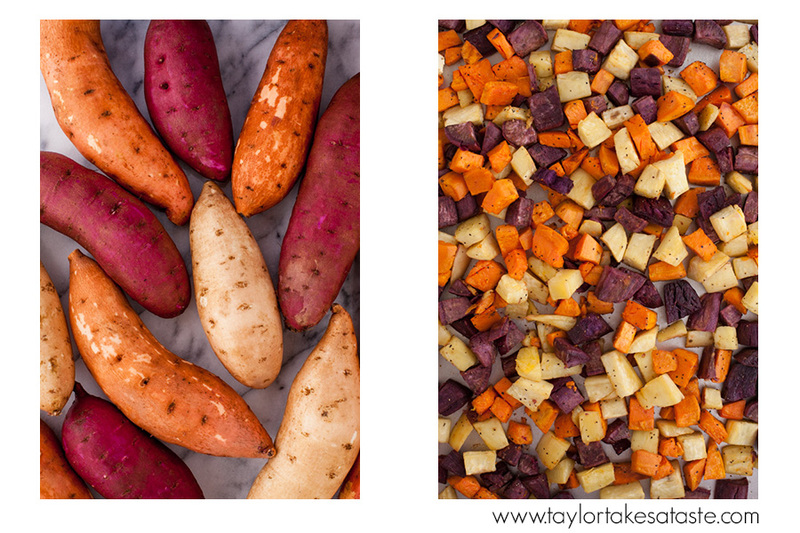 When Sally brought home a bag of these multi-colored sweet potatoes, there was one thing on her mind. 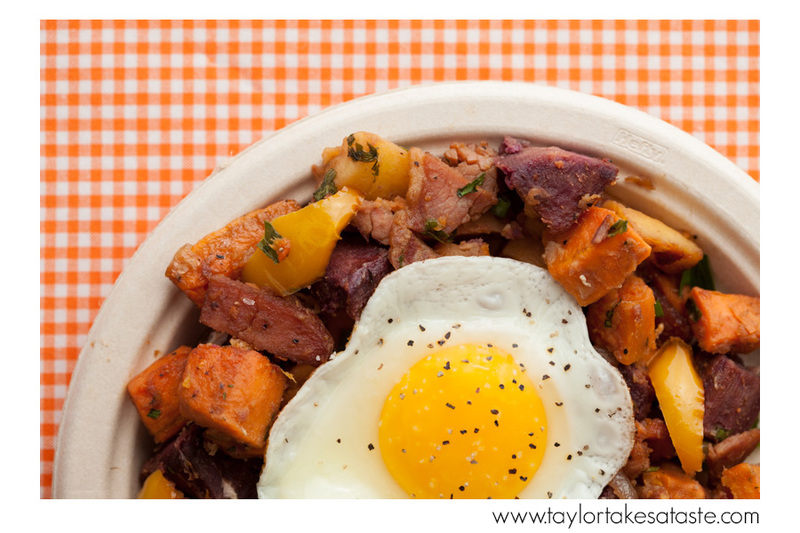 A sweet potato and country ham hash perfect for tailgating during a noon kickoff! With a noon game, you will generally only have time for one filling and hearty meal. 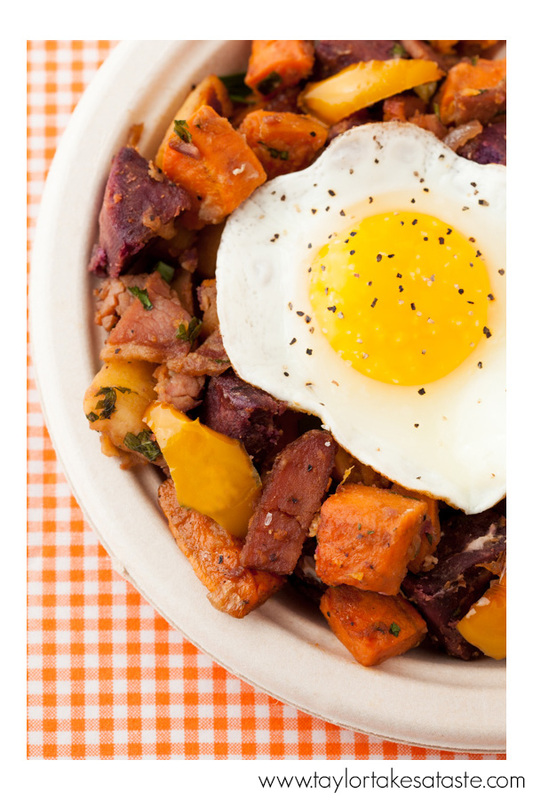 This Purple, White, and Orange Sweet Potato Hash with Country Ham when served with a fried egg is the perfect start to an early autumn game. You can make the hash ahead or time, refrigerate, and transport in a metal casserole dish or pan to your tailgate. You can heat the container and hash over a medium grill and cook the eggs to order. Clemson fans, you can use all three colors of sweet potatoes for a team-themed breakfast! If your school’s colors are purple and white (Furman or Holy Cross) you can theme your tailgate with just the purple and white sweet potatoes. Tennessee and Texas fans can use the orange and white sweet potatoes at their tailgate! 1. Pre-heat the oven to 400 degrees. In a large bowl, add the sweet potatoes, grape seed oil, 1/2 teaspoon kosher salt and 1/4 coarse ground black pepper. Using 2 spoons, toss the sweet potatoes until they are evenly covered with oil and seasonings. Empty the potatoes onto a baking sheet. Bake the potatoes for 30 to 40 minutes, stirring ever 10 minutes,or,until they potatoes are fork tender. Remove the potatoes from the oven. Cool on the pan. Reduce the oven to 350 degrees. 2. While the potatoes are cooling, soak the ham in warm water to cover for 5 minutes. (soaking removes some of the ham’s saltiness) Remove the ham, rinse with cool water and blot dry with paper towels. Cut the ham into julienne slices. Set aside. 3. Melt 1 Tablespoon of butter in a large, non stick sauté pan over medium heat. Add the ham slices, raise the heat to medium high and cook the ham, stirring constantly, for 3 minutes. Add the brown sugar and continue to cook, stirring constantly, for 1 minute. Reduce the heat to medium and add the cold coffee. Stir the ham and coffee mixture for 30 seconds to deglaze the pan. Remove the pan from the heat and empty the ham and coffee into a small mixing bowl. 4.Put the sauté pan back onto the stove and turn the heat to medium. Add 3 Tablespoons of butter. When the butter is melted, add the onions, peppers and apples to the sauté pan. Add 1 teaspoon kosher salt, 1/4 teaspoon pepper and 1/4 teaspoon thyme. Cook the vegetables apples, stirring frequently, until they soften, about 5 to 7 minutes. Add the cooked sweet potatoes and ham and coffee mixture to the sauté pan. Toss the ingredients until they are well mixed. Cook, stirring frequently, for 3 minutes. Turn off heat. Add the scallions and parsley. Toss hash to mix. 5. Put the hash into a buttered, 9X13 casserole dish. (at this point, hash may be refrigerated overnight before baking) Bake at 350 degrees for 15 to 20 minutes, until the hash is hot all the way through. Serve topped with fried eggs, if desired.